← Getting Comfortable with Gaming? Yesterday we got a new set of pcs at Sandaig,24 desktops and a pile of laptops, one per full-time equivalent member of staff. 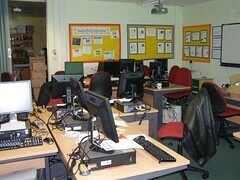 We decided to deploy all of the desktops in our media room leaving the laptops for classroom use. Hopefully we will also have a class in the box of wireless laptops as a pilot very soon. Even a committed mac-fan-boy like myself could not help but have a big smile on my face by the time I had finished securing the pcs on Tuesday evening. I had children testing the machines constantly today and so far it has been great. Children are able to have more than one app open without everything slowing down and really start to work properly. Unfortunately it is nearly the end of the session (I am not sure I really typed that) and there will not be much time to exploit the new kit until next session. Due to various factors I am not completely sure what stage I am teaching next session so I am not too sure in which way I’ll tap into ict yet. While the suite was out of action and there is a slight relaxing of the curriculum as the holidays approach I took the opportunity to let my class have a go with scratch. I downloaded it in the Spring break but have not really tried it out. I have it installed on a few non networked macbooks so it was idea for the network downtime on Tuesday. I got a couple of early finishers to work through the getting started guide and as they had no problems I grouped the class into threes and let them loose on the same guide. This starting children on an application you have not used yourself might seem a little irresponsible but I though I had enough knowledge of beginning programming (ifs and repeat) to figure it out on the fly. If hoots of laughter are a sign of active learning then scratch is a winner, the children had a great time exploring. We had a quick show at the end and I was delighted to see that all the groups had managed most of the first tutorial and taken there animation in different directions, using different aspects of scratch. The guide introduced ‘repeat forever’ loops but some of the children managed to use conditional if/then type constructs and other interesting features. Some of this was using the million monkeys approach, but I can already see scratch is a wonderful engaging resource and I hope to be using it a lot more. So we have 7 more days to go before the summer holidays and although I am really looking forward to the break and sharing in the general staff exhaustion of this time of year, there are also a ton of interesting avenues that I hope to explore next session. I’ve also been messing about a bit with the new glow pilot, not as much as I did in the spring break (time) but like Gordon I am not finding anyone to chat to. Usually as the summer approaches I’ve managed to get some sort of summer project together, last year it was the Podcasting Directory other years it has been wee html jobs, flash or the occasional bit of SuperCarding. This year nothing so far, I am not going away on holiday this year and am open to suggestions or offers. I am not really wanting to spend the whole summer slaving away but a wee bit of extra interesting work would be nice.